If Julio Jones or some other Falcon isn't in the opening intro on NBC this season my head might exploded. I'm sick of seeing less deserving players like DeSean Jackson and Nick Mangold in the opening over someone like Julio. lol I didn't know this was some big accomplishment. It's not. It would just be pretty cool to finally see the Falcons get some good pub. Who are you a fan of again? Cruz resigns with the giants. Basically a five year extension plus this years ten4er. Only 15 mil guarenteed. Good deal for both sides. Though he was offered tge same deal months ago. On to jpp and nicks. This is the way to build a team. Target your top players and pay them. Fill the rest of the roster with picks and underpaid free agents. Its just going to be Kaepernick the whole time. I didn't care about that. If the 49ers show him the money he will stay. I cant believe it is even a deal that he wears a hat of a different sports city. Who cares. Players are fans too. The kid is going to be special. Hopefully thethe doesnt ruin that for me. Not a 49ers fan, but Im looking forward to watching him play. As a Pats fan you saw up close just how special he can be. You're supposed to be representing and promoting your team....if the NFL has similar standards as MLB...he will be fined....meaning he shouldnt be doing it. Athletes need to keep their mouths shut. They are paid because of their athletic ability and not their 2 cent heads. Roddy White is one of the dumber players in the NFL. 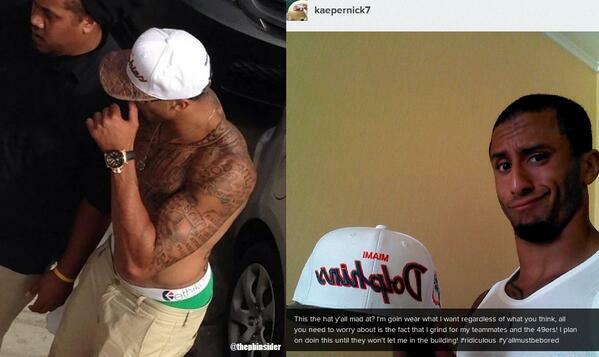 LOL off Kapernick wearing a Dolphins hat. What an idiot.